What is a quick ratio (acid-test ratio)? 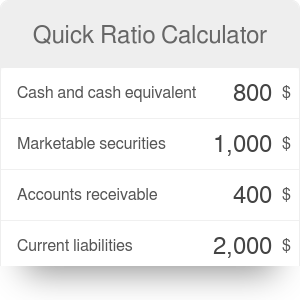 How to calculate quick ratio with our calculator? What is a good quick ratio? What is a quick ratio? How to calculate quick ratio? The quick ratio (acid-test ratio) is a simple indicator used to measure the ability of a company to meet its short-term obligations with its most liquid assets. In other words, the quick ratio allows you to determine whether or not a company has enough resources to fulfill its obligations that are due within a year. A very similar to quick ratio indicator of liquidity is current ratio. Note that liquid assets are considered here as assets that can be quickly converted to cash at the value close to their book values. You can obtain the exact values of this equation particular factors on the basis of the company’s annual report (balance sheet). Did you know that data in the annual report also allows you to calculate profitability ratios such as the return on equity and return on assets? Start with checking the financial statements of the analyzed company. In balance sheet prepared in accordance with the IFRS (International Financial Reporting Standards), in the part concerning current assets, you should find positions “Cash and Cash Equivalents”, “Investments in Financial assets due within one year” (this position is more or less the same as “Marketable securities”) and “Accounts Receivable”. In the part of a balance sheet concerning the liabilities find the position “Current Liabilities”. They are the sum of accounts payable, current income tax payable, current portion of loans payable, short-term provisions and other current liabilities. Fill the appropriate fields in our calculator and obtain the value of the quick ratio. You can find out more about the interpretation of this value in the next section of the article. A quick ratio equal to 1.0 means that the value of a company’s assets that are precisely convertible to cash exactly match its current liabilities. The quick ratio lower than 1 indicates that a company, at a particular moment, is not able to fully pay back its current obligations. It leads to the conclusion that the optimal value of the quick ratio (acid ratio) is 1.0 or higher. It is worth remembering that the general rule says that the higher the quick ratio, the higher he company's liquidity. Although the majority of financial analysts agrees that the quick ratio higher than 1.0 is acceptable, you should know that its optimal value depends on the branch of industry. The quick ratio is sometimes confused with the current ratio. Both of these indicators are liquidity ratios and are used to measure the ability of a company to meets its obligations. However, in the quick ratio the definition of liquid assets is slightly more restricted as it does not include inventory. In current ratio this position is counted, so the nominator is simply defined as current assets. If you are interested in corporate finance, you may also try our other useful calculators - the EBIT calculator and the EBITDA calculator. Quick Ratio Calculator can be embedded on your website to enrich the content you wrote and make it easier for your visitors to understand your message.